Today is Day Four of Christie Wright Wild’s PB 14:14. Be sure to check out the other books people are using to teach one of the Top 10 Elements for picture books. Although there are some wordless picture books, most picture books have a balance between words and pictures. EACH WORD COUNTS…that’s what picture book writers hear all the time. Because most picture books have only 32 pages…and because most picture books have under 1000 words…and because most young kids have short attention spans, the words that are used need to be the right ones. So it’s not surprising that word play is one of the top ten elements that make a picture book popular with kids. Here’s a book that is very strong in this element. 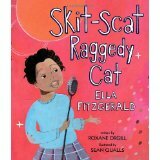 This entry was posted in PB 14:14, Top Ten Elements in Picture Books - Word Play and tagged Christie Wild, Skit Skat Raggety Cat, Word Play by viviankirkfield. Bookmark the permalink. Wow!! That girl’s got some Rhythm!!!! Love that! Thanks Ms Kirkfield!!!! Dancing up a storm Ms Kirkfield!! Sounds like a great book, and definitely one that I need to check into, thanks! oh, cool! I didn’t know this book existed. Thanks for posting about it, Vivian. I’m learning about so many non-fiction books as I follow Kristen Fulton’s 52 Weeks of Charting Non-Fiction, Linda…glad you liked it! I’ve read this one too – it’s so much fun! Thanks for including the video of Ella. She looks like she’s having such a great time! Yes, she was definitely passionate about her music, Laura! And when we love what we do, it’s easy to have a great time. 🙂 Thanks so much for stopping by! 32 pages – less than 1000 words – short attention spans… yes, all good reasons to make every word count! Good choice, Vivian! Rich! Loved Ella Fitzgerald and her music. I’m a fan of jazz, and this book will be on my wish list! Music is a great path to reading, so glad you shared this today Vivian. Thanks. OK, so now this one’s on my growing list….. Thanks!